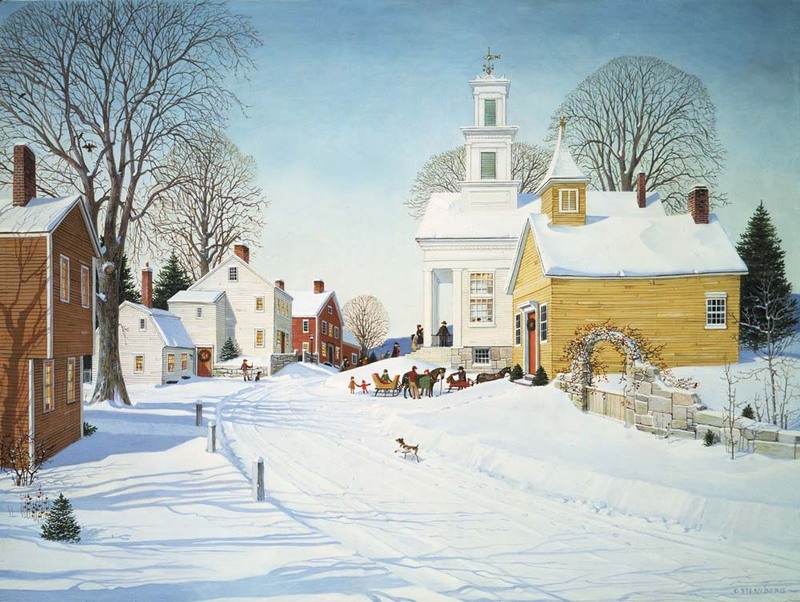 A painting based on a small Connecticut town–Winchester Church. In Syracuse in 1950, Charlotte had an illustration assignment. She had been at the New York State fair all day, gathering reference for a Collier’s cover, and came out late in the evening. Only one restaurant was open. She went in and asked for a table—only to be refused. Decent girls, some thought, didn’t eat late by themselves. In all of her career, she had never been in such a situation. She went out and saw the light of a police station down the street. She went in, told the police the story, and showed them her identification. A policeman took her back to the restaurant, and announced, ”You have to feed this person.” Embarrassed, upset, and nervous, she ate with the cop at her side and her eyes on her plate. She never forgot this debacle. While she had generally been treated well in the business world, this was an exception. She exhibited landscapes at Ferargil Galleries in New York City at this time. The majority of her paintings were based on the rural landscapes of Connecticut: this was the place that she went home to. While much development has occurred here, there are still beautiful and inspiring glimpses of the past. Connecticut’s landscapes are more intimate than many other American scenes. Small towns, each their own microcosm—the barns of yesteryear found in backyards—occasional farms–rolling hills traversed by brooks and stone walls—glowing autumnal color—all of this is part of life in this region. Communities cherish it, and, increasingly, work to preserve it. In common with other regional artists of the twentieth century, Charlotte loved her home and wanted to share the beauty of it with others. Viewers of her work often notice West Peak in Meriden, an enduring sign of her affection.